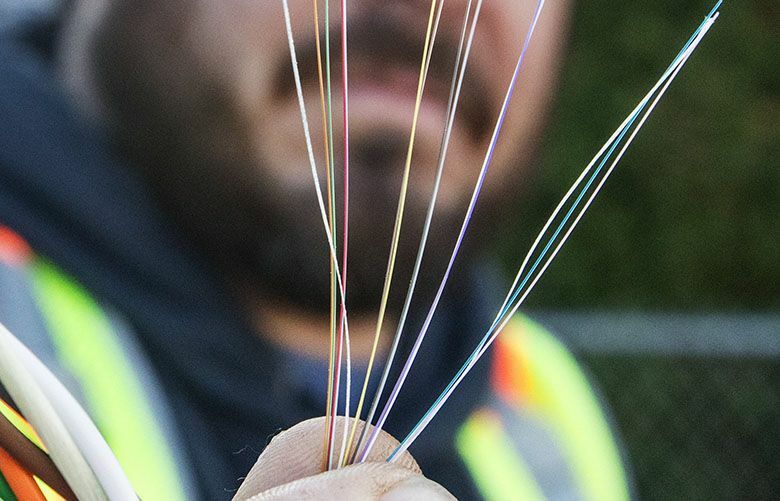 A fiber splicer for Wave Broadband holds fiber optic cables while working to expand a broadband network in North Seattle last year. One of the most fundamental competitive tools for landing any high-tech headquarters is underperforming in many U.S. metro areas. Seattle mayoral candidate Cary Moon has said she would push to make municipal broadband a reality. Her rival, Jenny Durkan, gave the Urbanist a more ambiguous answer. But Seattle-Tacoma-Bellevue already ranks 22nd out of 100 metro areas in broadband availability and adoption. More competition and better access for more people would help, but not be economically decisive. Only 0.3 percent of the metro population, about 10,000, lack availability. The same isn’t true for many of the 100-plus cities that are vying for Amazon’s HQ2, its planned co-equal headquarters with Seattle (and maybe someday the headquarters). Take Tucson, Ariz., which profaned a 21-foot-tall saguaro cactus by uprooting it and shipping it to the hostile terrain of Seattle (it takes a baby saguaro, native only to the Sonoran Desert, 10 years to grow 1 inch). Tucson ranks 78th out of 100, in addition to lacking urban bones, a decent transit system and no real international airport. It does have the University of Arizona but, like Phoenix, has a very difficult time keeping young talent. Good luck. Poor Tulsa, Okla, (a very nice little city) lacks transit and a major research university, and allowed its once grand Art Deco downtown to fall apart. It ranks 97th. According to a new report from the Brookings Institution, most U.S. metros are far behind on broadband, “a fundamental component of the American economy, creating new ways to educate, employ, bring services to, and entertain every person” and “the essential infrastructure for unlocking the internet’s economic benefits.” The United States, according to Speedtest, has only the ninth-fastest fixed broadband in the world, even behind Romania. In America, the digital divide plays out between urban and rural, but also within metro areas in poorer and wealthier neighborhoods. There’s a correlation between slow speeds or lack of availability and high poverty. As Brookings shows, price is a big factor. Twenty-eight advanced nations have less expensive service than USA! USA! It doesn’t help that our broadband providers have near monopolies. Also, they exert enormous influence on lawmakers and regulators to perpetuate the status quo. The report allows you to search by metros and within them, and also offers some policy prescriptions. You can find it here.